“Let this mind be in you which was also in Christ Jesus” (Philippians 2:5). See also Romans 12:2, Proverbs 23:7, Philippians 4:8, and Proverbs 17:22. Did you know that your mind controls your brain and not the other way around? Your brain is neuroplastic, that is, it can be changed and molded—it has a plasticity factor. Invariably, you get to be your own potter with this piece of clay that God has given you, full of centers of control to drive action. This piece of awesome clay, the brain, reacts to positive and negative thoughts which reside deep in your unconscious then surface when there is a stimulus generated through the five senses. Focused daily meditation allows for reflection and reorganization. Good healthy thoughts, once formed into habit, become a powerful force that can crowd out bad, negative thoughts. The good news is that you’re not out there alone in your pottery struggle. 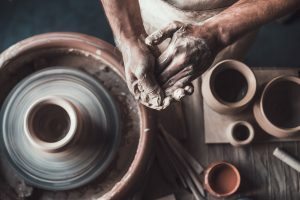 There’s a Master Potter present and available, but you’ve got to truly keep connected to Him frequently and deeply, for He is the source of good thoughts. Of course, there’s another potter too, and he’s got his own plan of negative thoughts. There is a battle between the two potters for your clay, and you get to make some choices, through some thoughts and commitments. The Sabbath, created for man, is a powerful reflective antidote and tool of opportunity that helps to refocus a brain that works 24/7, even in your sleep, so that we can be transformed and not conformed. Push up your plasticity—mind controls matter, and choose the Master Potter as the origin and source of all thoughts, for it will make you healthier in body, mind and spirit. Let us join Tramaine Hawkins in “The Potter’s House”and get our thoughts back on track 24/7. If you’ve got any broken thoughts anywhere, it’s an early opportunity to mend in the Potter’s house.